"It's like the doctor said: 'Crime don't pay!" "He was a good all-around ballplayer. He was a good batter, good fielder, and fast - he could steal anything, so they said." "There was a couple of other kids I would have picked to go that way. But I never would have picked him." "It was not the work of amateurs." "Maybe I'll learn someday, Dad, that you can't win in this game." "He said he expected they would be here after him, but ... said he didn't know if they would or not for sure." the guns they were carrying." "There wasn't a heavy drinker in the crowd ... They was all nice, clean boys." "A jail is just like a nut with a worm in it. The worm can always get out." "From what I hear, I'm surprised Dillinger didn't serve tea to the guards before he went away." 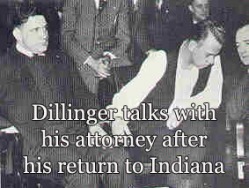 - Prosecutor Robert Estill, speaking after Dillinger's escape from Crown Point, Ind. "I made him coconut cream pie, fried chicken and everything that goes with it." from all the evidence, was a wooden one." "It was the worst thing that ever happened to me since I had a brand new pair of boots burned off in a forest fire."